It’s the shared experience that matters – are you in Gen C? Influenced and inspired by @briansolis author of ‘What’s the Future of Business’ #WTF & principal (American speak for top bloke) at Altimeter, I have sat & reflected on a number of elements in my marketing strategies, in fact deeper, my whole business strategy. Strategy is a dangerous word to be honest, more my business thinking. Strategies, like oil tankers, take a long time to change course, I’m in a world where agility and adaptability are paramount. I talked previously about saying ‘goodbye to the old school world’, however, that’s becoming increasingly more difficult as things change so rapidly. The old school might not be thinking from 20 years ago, but it could be last year’s thoughts. @briansolis talks about digital Darwinism – a brilliant phrase to describe the evolution of consumer behaviour, when society & technology evolve faster than our ability to adapt. How consumers, yours & mine customers, decide to buy has changed enormously, he describes a new generation – Generation C.
What is Generation C? We’ve all heard of the Generation Y, well Generation C is not about age, income, background, in fact kiss goodbye to the old school ABCDE demographics, Generation C is about behaviour and influence of shared experiences. It’s is the connected generation. An ever increasing number of your potential customers will make their decisions about your product or service based on shared experiences they find through social media channels. Ask, as I have, is your service/product providing great experiences? It is not good enough anymore to simply tick boxes and have a website, Facebook, Twitter, LinkedIn, Google+ etc, etc. it’s about creating exceptional experiences so that people share them. You can’t just have great marketing, now at every touch point the experience has to be great, something that you want shared. Just by using social media will not make your business fantastic and something people want to share, the experience across all aspects of it will, if it’s truly exceptional. Otherwise you risk them sharing a bad experience. Generation C will trust the shared experience, good or bad, from strangers in their connected social media sphere before anything you will put on your website or newsletter or other marketing communications. As @briansolis points out word of mouth evolves from one-to-one to one-to-many conversations. An audience with an audience of its own. They will do all their research through social media not through the more traditional methods that we think they do. They will look at your website on a smart phone or tablet, how does your site look on them? The behaviour of the future customers of all our organisations has changed forever and will continue to change. So it’s not just about exceptional & engaging content, it’s about the experience. So look across all aspects of your business – design and create exceptional experiences for your Gen C customers to share. 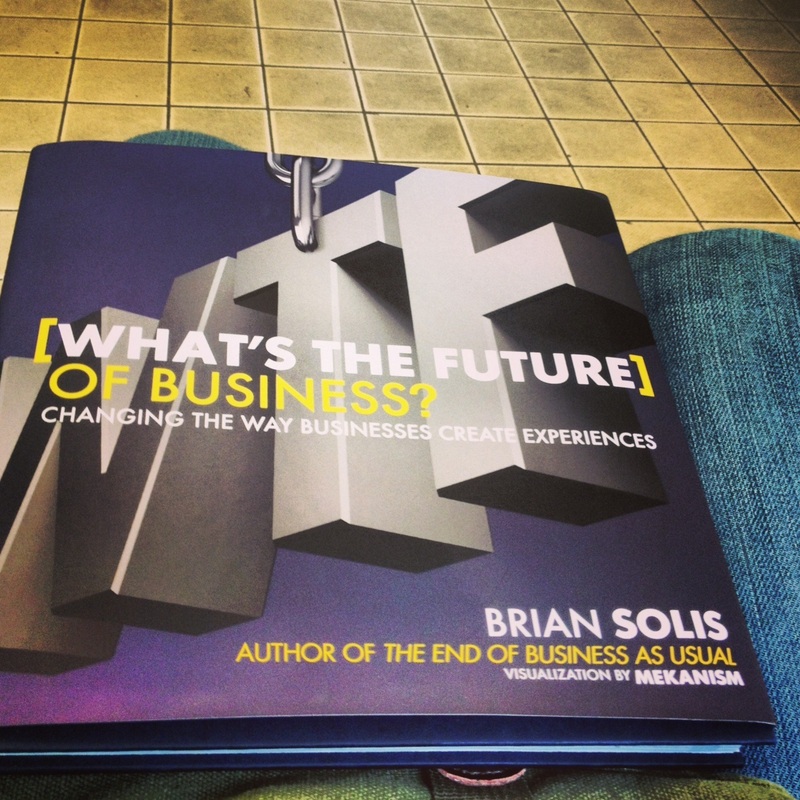 Finally, the thing that stood out for me reading @briansolis ‘s book was, I am reading a hardware book not a software ebook. It’s great to read, as it’s laid out in a way for the connected generation, with short snapshots of concise text, easy to read, infographics, a virtual slider that is more common to online content and it’s an exceptional experience that I’m sharing with my connected audience.